Happy Easter everyone! 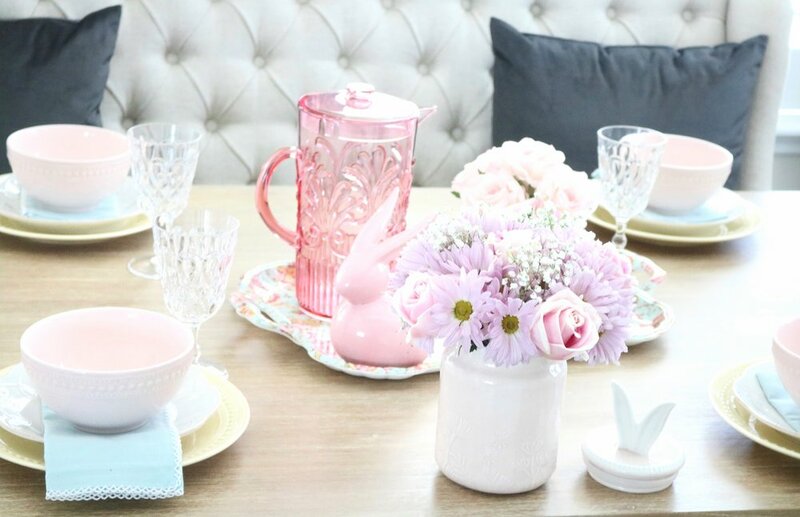 Today I am showing you how to re-create this pastel Spring table-scape that is perfect for all your Spring Entertaining. So I found most of my pieces at homegoods, and then my good dinnerware I mixed with these pastel pieces is Lenox French Perle and can be bought at most department stores like Macy's or Bloomingdale's. Keep your eye out for anything Pastel. Pastel's are super hot this Spring, which I am absolutely loving. Detailed etched edges in dinnerware to mimic lace, or scalloped borders are also fine details to keep an eye out for. Also Look for pretty pastel napkins in a gingham print, seersucker, or solid with some fringe or eyelet detail bordering the edge line to add that extra feminine touch. You can shop my table-scape favorites for Spring to mix and match all right here, by clicking the product image you like below. Happy Easter, He is Risen indeed!